Thanks for the tip-off McHilly. I've booked the same for my family and I. What persuaded me to book was the cancellation policy and it was book now and pay later - and the payment day is a few days before arrival. So no real money at stake if I can't make it. I've joined in with the Belaire crowd, also couldn't resist the pay later. Matt - you mean it's not just me who has been eating everything in sight? I've just today decided to try to rein it in. You lot convinced me again. Despite saying not till 2020 I've just reserved the Belaire as loved it this year. I will probably cancel. And changed my on call weekend today from 10th June.. .. Please send me the coconut ones. They are not for me, they are for a friend. Hi all, I don't really have any business posting here as I'm not doing Comrades 2018, but this is a dream race for me that I've wanted to do for years and I always promised myself I would do it one day, probably in the year of my 40th birthday. Anyway, after seeing a tweet from comrades, saying that race would always be on the second Sunday of June from now on, I had a date I could actually put in my calendar, 14th of June 2020 for the down run. Despite it being a long way off, just the act of putting it in the calendar was exciting enough! Getting myself over to South Africa for this is going to be a failry big financial commitment as I don't earn a huge amount, and will probably mean a relatively extended period away from my family as I doubt we'll be able to get all of us over, so it'll likely just be me. I've already started looking at what flights are like and am unsure of best way to get there as I'm not seeing much in the way of direct flights and what I can see looks very pricey. Is it worth flying straight to Durban (with a changeover) or do people fly in to Johannesburg or Cape Town and travel on from there? Assume flying to Pietermaritzburg isn't an option? A rough idea of what people are paying for flights would also be useful. Anyway, I'll be lurking here and on the 2019 thread when it arrives, before I can finally join in properly for the 2020 one. Can't wait! Cotswold Runner, one option which might suit is Emirates. Prices are reasonable and you can fly from some regional airports (Birmingham any good?) to Dubai and then from Dubai to Durban. That's what I normally do anyway and this year paid about £470. Thanks Becca, that sounds perfect. Birmingham pretty close to me. I was only really looking at London as I assumed that's where I'd get a direct flight from but the prices were coming in over a grand and they weren't direct anyway. Sorry, I have one more question. In terms of race entry, am I pretty much guaranteed to get in if I enter (and run the qualifying marathon of course) or is it a ballot? From what I can gather, it's the former. I don't think there are direct flights at present. You have a choice of a very long flight to Jo'burg and a short one to Durban or two long ones via Dubai. There are also options with a short flight to continental Europe, then Jo'burg then Durban. It's very easy to enter - no ballot and it does not fill up very quickly once it opens in September. You do need a qualifier but you don't have to have that at the time when you enter and a sub 5 hour marathon suffices. Thanks for the info Becca. Are you running 2018? Yes, fingers crossed. 2018 will be my 6th and hopefully will be around for the next few. There have often been flights available between £500-600, if you keep your eye open for good deals. Generally the Dubai route is slightly cheaper, but you might be able to get a good deal via Joburg if you time it right. Bear in mind that although it's expensive to get there South Africa is pretty cheap to stay (at least unless the exchange rates do something horrible, which is always possible). For example, this year a very nice hotel on the beach, with a big room, breakfast and wifi, was less than £70 a night. You'd have to try quite hard to pay more than £20 for dinner. Just booked Belaire - that is a good deal isn't it? Still hankering after The Hilton but they were too wily this year and didn't leave standard rates available for the 2018 dates. Best I can currently find is over £200 per night! Plenty of time to see if that comes down though with the free cancellation on Belaire right up to 24 hours before arrival. It's really good to see all the early plans appearing for 2018. I only got home on Wednesday 22nd after a great holiday. Enjoyed my PADI advanced scuba certification, some mountain climbing and visiting many friends. A whole lot of 'consolation' for not having been able to run this year's Comrades! (If anyone thinks of some diving next year, it costs about 1/2 as much in SA when compared to UK or Europe). I went for my first 10k run yesterday after not having run since Durban Park Run over 3 weeks ago! That showed me just how unfit I've become - a lot of catching up to do! I just hope to avoid further surgery or other mishaps this time! SS, you asked about London. Yes, I have completed my good for age 70 entry so I'll definitely be there, along with your OH!. I've also booked Belaire for 2018 and note our ever increasing numbers staying there - that will be great. 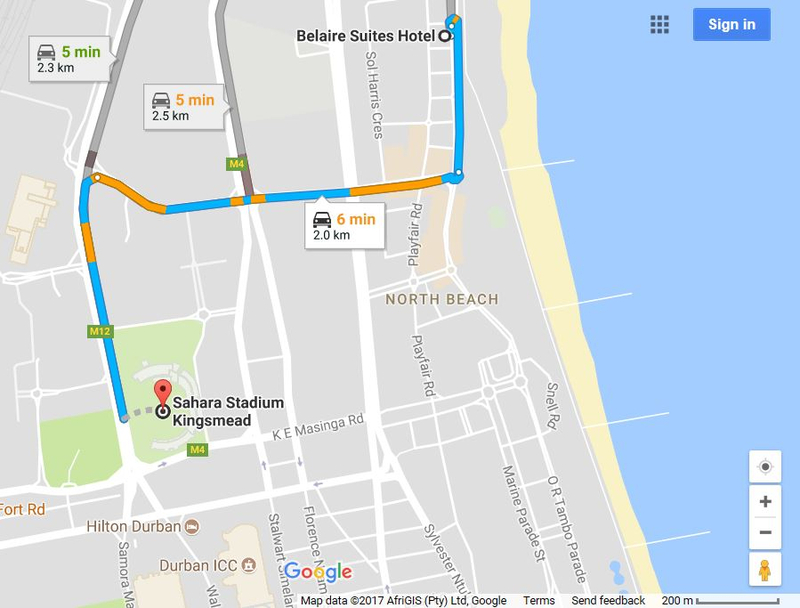 I've been 'promoting' Belaire after staying there each of the last 6 years - in my view the best 'Comrades time' value and location! 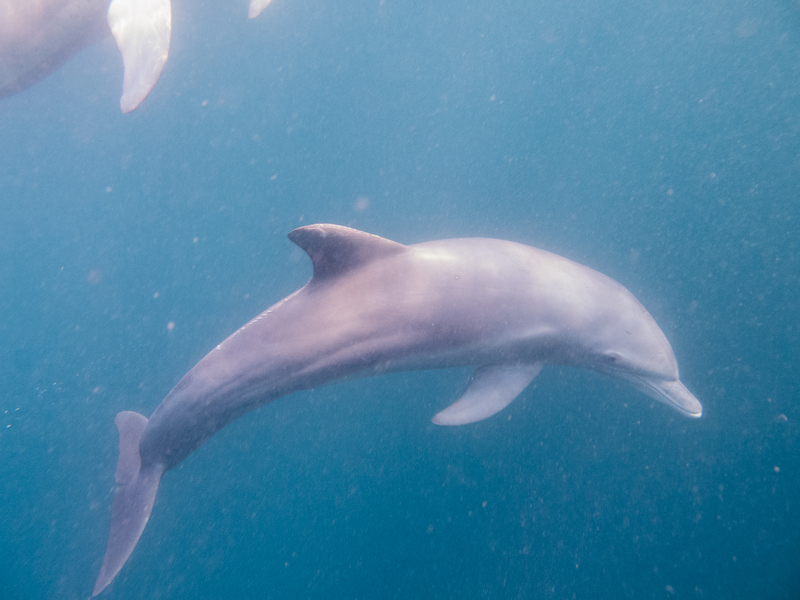 As a variation from recent Tapirs, I've attached a pic of one of my 'dive buddies' at Sodwana Bay. There was a pod of about eight, right next to us! I also have a video of them but it cannot load up here. I took a cab one night from the Hilton to Belaire to see friends and it seemed quite a hike, dirt cheap though. The thing that I can't weigh up there is the Belaire's popularity but its relative inconvenience for any Comrades activity? At The Hilton I saunter over the road to the Expo, trip a few footsteps to the buses on a down run or the start on an up run, the drop-off point for the bus home on an up run and the walk out of Kingsmead on a down run are literally 56 foot steps back to the Hilton. So, how does everyone do the logistics to and from The Belaire in comparison? Does the Belaire have a constant buffet of food on tap in the restaurant? How late does it stay open? Lowrez, The only advantage I see for the Hilton is it's proximity to the expo (which is not too bad a walk or a cheap taxi ride from the Belaire). The downsides of the Hilton are price, far from the beach promenade and not in a great part of town. 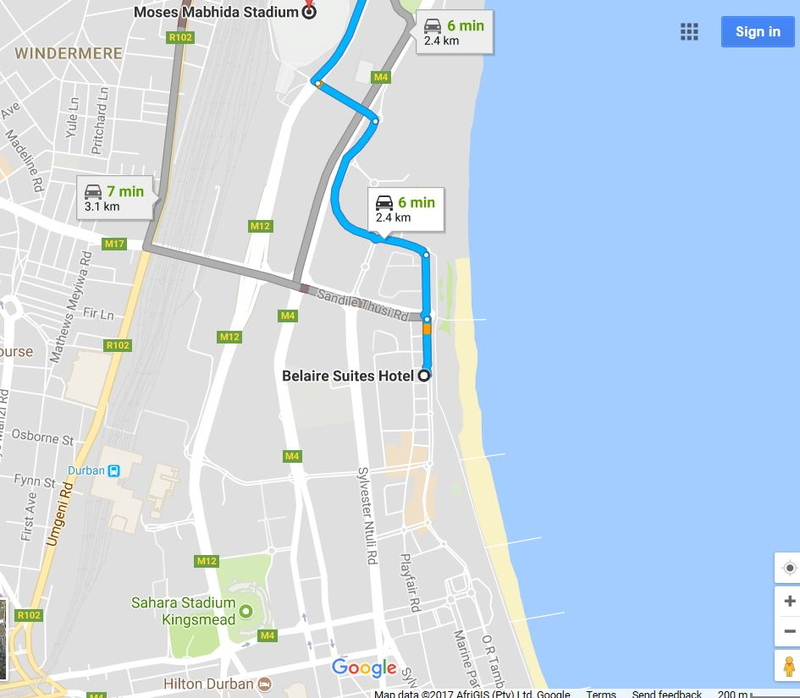 Belaire is virtually on the beach for a walk or swim and a short stroll to Mugg & Bean etc on the Monday. It's also a short walk to the Park Run!. We share a taxi to the start of up-run and the returns buses also go beyond Hilton to at least the Maharani - 400 yds. away. For a down run, we have previously shared a taxi to 'Maritzburg - only costs about R300 each for four and is far more pleasant than the dodgy buses. In fact last year, when Debra couldn't run, she acted as driver back from 'Maritzburg in my rental car, after offloading me, Jock and Karen at the start. Belaire has its 'Cafe Jiran' which is open all day, I think until about 10pm. Belaire breakfasts are superb, including from about 3am onward on race day. Hmm - 200m v 2000m walk in the dark hiding a Vic Clapham medal in my hand? My stay is so short that my feet never touch the ground, so I've never had time for the beach and such. I suppose the Monday is where I have most time but even then, with the final activity being at Joe Cool's, Hilton wins again. The finish won't necessarily be at Sahara Kingsmead next year, though. Oh no I would be well scuppered! I've always maintained that a little walk post race helps to stop the legs from stiffening up. Think it's a little shorter on foot as well. So Lowrez, .....what goodies are you designing for us to wear next year? ?